The stakes in the men’s 4x100m Relay in Moscow were higher than usual. Before the event, Russia led the medals table with seven gold medals against the United States with six gold medals and Jamaica with five. With a win in the final event, USA would move to the top having plenty more silver medals, but the odds were against them from the start. Jamaica had won the last four global 4x100m titles between 2008 and 2012 and the last US victory was back in 2007 in Osaka. The race started with a blazing opening leg from USA’s first runner Charles Silmon, the 2013 NCAA 100m champion. The 22-year-old, competing at his first World Championships, went out in the 100m heats with a slow 10.34, but his run today was very different, bringing the baton to first exchange in the lead eclipsing Jamaican Nesta Carter, the 100m bronze medallist at these championships, in the process. Great Britain was also well in the picture for the medals with their 200m star Adam Gemili starting the relay. Mike Rodgers, sixth in the 100m here and competing in his first major championships relay, continued well for the United States keeping them still a little bit ahead of their Jamaican rivals down the back-straight. Kemar Bailey-Cole, fourth in the 100m, was the second-leg runner for Jamaica. At this stage there were still other teams in the race too with Great Britain, Canada and Germany in close contact to the medals. As so often happens in championship relays, it all came down to the last exchange and it didn’t go smoothly for all of the teams. Mookie Salaam did a great job for the USA on the third leg, opening up a lead of about one metre or so before the final exchange, but then it went all wrong before the baton reached anchor-leg runner Justin Gatlin. Salaam, competing at his first World Championships, looked to reach the takeover zone as the first athlete, but Gatlin seemed to be hurrying a bit, starting too early and clearly moved out of his lane to the outside towards the Jamaicans trying to reach for the baton, but the exchange was finally completed within the rules. 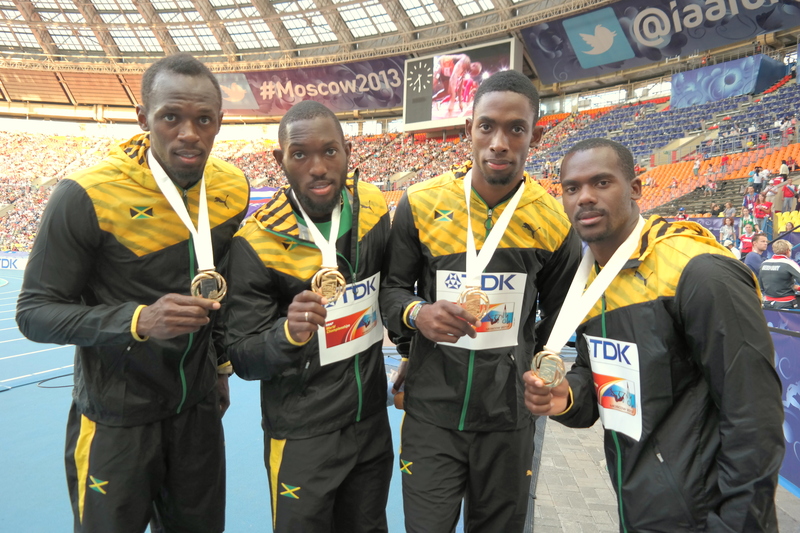 The Jamaicans, with Nickel Ashmeade running in the relay team for the first time at a major championships, completed the exchange much better, if not perfectly, and Usain Bolt started the final leg from a leading position, which he would never surrender, winning in a world-leading 37.36. This was Jamaica’s fifth successive global championships gold medal in the men’s 4x100m Relay; they have won the past three World Championships and last two Olympics. Five in a row is the best in history, although United States could have done much better, had it not been for the 1980 Olympic boycott. They won seven global championships in a row 1964-87, with that one missing title in 1980 when they didn’t take part. USA also has a more recent four in a row between 1999 and 2003. Gatlin anchored United States to the second place in 37.66, but Great Britain, who crossed the line in third, were disqualified for their troubles on the second exchange when Harry Aikines-Aryeetey and James Ellington failed to exchange the baton within the zone. There was further drama in the last exchange for the eventual bronze medallists, Canada. Their third-leg runner Dontae Richards-Kwok seemed to bring the baton to the last leg runner in third place, but the Canadians did not perform a smooth passing and they lost their edge before the final leg. They finished behind Britain but were later promoted to the bronze medal in a 37.92 season’s best, the first sub-38 second clocking for Canada since August 1997, 16 years ago, when Donovan Bailey anchored their team in 37.86 for the gold medal at Athens World Championships. This was also their first global championships medal in this event since that 1997 gold, with fifth place from Berlin 2009 being the best achievement between 1999 and 2011. Germany’s Martin Keller brought their baton over the finish line in fourth place clocking 38.04, their second-fastest ever time and just 0.02 seconds behind their 38.02 national record from 2012. Their fourth-place finish matches Germany’s best ever placing in this event in the history of the World Championships; East Germany was fourth in Helsinki 1983 and West Germany in Rome 1987. The Netherlands was fifth in 38.37, their best since a bronze medal in 2003, with Japan in sixth (38.39) and Trinidad and Tobago in seventh place (38.57). It was just the fourth time in history that all three medallists have broken 38 seconds; the other three occasions also happened at previous editions of the World Championships. The fastest bronze medal time is Canada’s 37.83 in Stuttgart 1993, while the best bronze medal time in the history of the Olympics is 38.00 by Cuba in Barcelona 1992.